Not long ago, public health officials were obsessing over the possibility that “skunk” marijuana—loosely defined as marijuana exhibiting THC concentrations above 12%, and little or no cannabidiol (CBD), the second crucial ingredient in marijuana—caused psychosis. In some cases, strong pot was blamed for the onset of schizophrenia. The evidence was never very solid for that contention, but now the same questions have arisen with respect to synthetic cannabimimetics—drugs that have THC-like effects, but no THC. They are sold as spice, incense, K2, Aroma, Krypton, Bonzai, and dozens of other product monikers, and have been called “probationer’s weed” for their ability to elude standard marijuana drug testing. Now a group of researchers drawn primarily from the University of Trieste Medical School in Italy analyzed a total of 223 relevant studies, and boiled them down to the 41 best investigations for systematic review, to see what evidence exists for connecting spice drugs with clinical psychoses. Average age of users was 23, and the most common compounds identified using biological specimen analysis were the now-familiar Huffman compounds, based on work at Clemson University by John W. Huffman, professor emeritus of organic chemistry: JWH-018, JWH-073, JWH-122, JWH-250. (The investigators also found CP-47,497, a cannabinoid receptor agonist developed in the 80s by Pfizer and used in scientific research.) The JWH family consists of very powerful drugs that are full agonists at CB-1 and CB-2 receptors, where, according to the study, “they are more powerful than THC itself.” What prompted the investigation was the continued arrival of users in hospitals and emergency rooms, presenting with symptoms of agitation, anxiety, panic, confusion, combativeness, paranoia, and suicidal ideation. Physical effects can includes elevated blood pressure and heart rate, nausea, hallucinations, and seizures. One of the many problems for researchers and health officials is the lack of a widely available set of reference samples for precise identification of the welter of cannabis-like drugs now available. In addition, the synthetic cannabimimetics (SCs) are frequently mixed together, or mixed with other psychoactive compounds, making identification even more difficult. Add in the presence of masking agents, along with various herbal substances, and it becomes very difficult to find out which of the new drugs—none of which were intended for human use—are bad bets. In the end, the researchers can do no better than to conclude that “the exact risk of developing a psychosis following SC misuse cannot be calculated.” What would the researchers need to demonstrate solid causality between designer cannabis products and psychosis? More product consistency, for one thing, because “the polysubstance intake pattern typically described in SC misusers may act as a significant confounder” when it comes to developing toxicological screening tools. Perhaps most disheartening is “the large structural heterogeneity between the different SC compounds,” which limited the researchers’ ability to interpret the data. 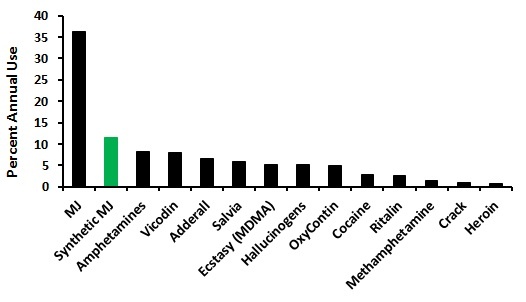 This stuff matters, because the use of Spice-type drugs is reported to be increasing in the U.S. and Europe. Online suppliers are proliferating as well. 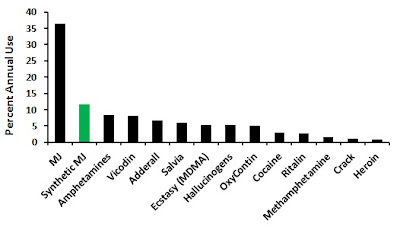 And the drugs are particularly popular with teens and young adults. Young people are more likely to be drug-naïve or have limited exposure to strong drugs, and there is some evidence that children and adolescents are adversely affected by major exposure to drugs that interact with cannabinoid receptors in the brain. We wrote a blog on this as well. Terrible. Addressing this issue, that unfortunately leads some people to serious and completely avoidable health problems, truly reinforces the basis for making sure that the youth of America receives education regarding the plethora of synthetic drugs being widely produced. It is a devastating statistic. Looking at your key words, I thought this was about marijuana. So much discussion about the tools of addiction and rarely about the motivation for addictive behavior. Sigh...do not pay attention to the underlying cause of addiction behind the curtain. Often called synthetic marijuana, hence the keyword confusion. I don't spend much time discussing the "motivation" for addictive behavior, because to me that's like discussing the "motivation" behind chronic high blood pressure. The motivation for addictive behavior is the existence of addictive drugs, and the existence of people with a biochemical propensity for abusing them. While convenient, the assumption that addictive behavior is merely the result of the presence of drugs and biochemical propensity is too simplistic for my taste. The significant differences in drug abuse trends between cultures cannot be explained away with genetics. A deeper look at the causes at the root of addictive behavior would be a great addition to this valuable blog. Self worth and self control are learned traits, how can we expect young people to avoid addictions without confidence that they can be in control of what they consume? Of course there are environmental impacts on drug addiction, just as there are environmental impacts on diabetes, high blood pressure, and other chronic biological disorders.